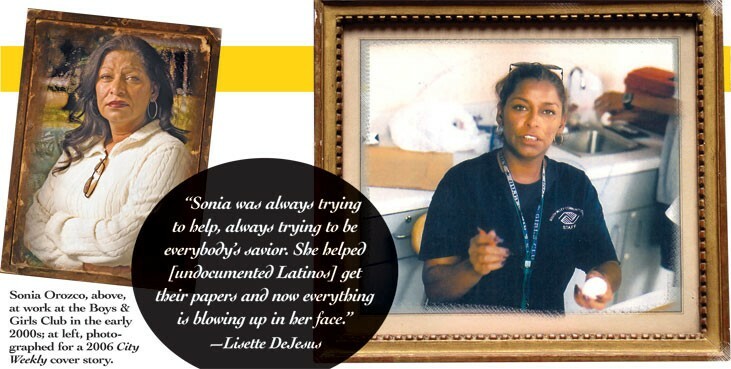 When Jesus Silva was arrested in August 2011 after his wife said he assaulted her, Walt Hunter, Silva’s friend and mentor, called the one person he trusted to help the undocumented 26 year-old: Sonia Orozco. Back in 2002, Hunter and Orozco, an ex-gang member turned award-winning gang-prevention counselor, were a team of at-risk youth counselors at the Midvale Boys & Girls Club. They counseled Silva and many other undocumented youths who wanted to leave gang life but had nowhere to turn. Hunter, now 68, and Orozco met at the Midvale Mining Café to talk about Silva. Orozco told him she could get Silva out of jail. The 50-year-old, then a Jordan School District employee, would work “something out with immigration,” Hunter recalls her saying. There were ways of avoiding Silva ever having to go to trial, she continued, mentioning the names of Midvale and West Jordan cops she worked with on gang-related issues. All Orozco needed was $595. Where, she wanted to know, would the money come from? By chance, Silva rang from jail. “Don’t worry, mi chuyito, we’re going to get you out,” Orozco told him triumphantly. “That, to me, sounded like heaven,” Silva says during a jail interview. Yet Silva, an award-winning artist and former gang member turned anti-gang advocate who met Orozco when he was 15, knew that she was not all that she seemed. In 2001, he says, she had gone to a company where his brother worked and persuaded 10 undocumented workers to each give her $1,000, with promises to get them citizenship. “She never helped them out,” he says. 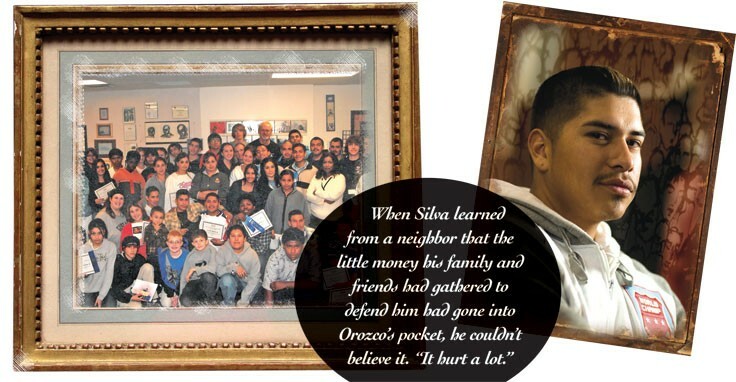 Even knowing this, Silva loved Orozco. “In my heart I always believed she had our back,” he says. In such a vulnerable population as undocumented Latinos, prone to predators from within the community and without, Orozco, who worked closely with law enforcement across the valley, was a godsend. It was “the way she talks to you, she made you feel welcome, that she was just a person you could trust,” Silva says. Several days later, on Sept. 9, Silva’s neighbor, who had given Orozco $100 toward getting Silva out, called Hunter after hearing that Orozco had been arrested. “She stole our money,” she told him. Orozco was well-regarded in the Midvale community—not only by Latinos, but also by outsiders like detectives, judges, social workers and educators, who all relied on her experience and wealth of information and admired her commitment to undocumented Hispanic at-risk youth. Now, while she’s held in Salt Lake County Jail under an unusually high $100,000 bail, more victims are coming forward. With her preliminary hearing set for Nov. 1, dismayed colleagues, friends and former students are struggling to come to terms with the depth of her betrayal. In the weeks after Orozco’s arrest, Hunter discovered that more than a dozen undocumented youths he knew had been victims of Orozco. The allegations facing “my friend Sonia” leave Hunter deeply conflicted. He switches between remembering the good times when together they helped the youths they loved, and recognizing that many of them were too scared of Orozco to tell him what she did to them. “I don’t know why I should care about her,” he says. After one alleged victim told him she forgave Orozco and prayed for her every day, Hunter decided to visit his former colleague in jail to learn her side of the story. Some victims say Orozco was working with others, possibly Immigration & Customs Enforcement employees, who, for a payment, helped undocumented people stay in Utah, something Orozco herself claims. “I work with people in INS,” she says from jail. “I get people out [of deportation problems].” Charges filed by the District Attorney’s Office, however, state Orozco has no position or authority with immigration. The child of Puerto Rican migrant workers, Orozco told City Weekly in March 2006, she worked the fields for $3 an hour along with her nine siblings, moving from one farm to another. When she was 7, her family settled in Midvale, and she has lived near there since.